3.1 Teacher recognizes the value of understanding students’ skills, knowledge, and language proficiency and displays this knowledge for groups of students. As an English Language Arts teacher, understanding students’ skills and knowledge depends on understanding their language development. One way in which we display our understanding of student language development is through story. Here I have included a slide I made for a group presentation on cognitive development theories and their application in the language learning classroom. The slide was created for EDU 6132: Learners in Context. Though simple in content, this slide represents my understanding of story as a complex teaching tool. Self-efficacy requires self-understanding. Vygotsky’s theory of language development describes a move from external to internal language; for Vygotsky, adult thought is dependent on the development of inner speech (Pressley & McCormick, 2007, p. 154) As educators, we need to address that “space between” external and inner speech, to help students move from heard language, or words on a page, to the internal voice that makes conversation and reading personally meaningful. One way to do that is through stories, which create self-understanding (inner speech) when the reader connects their own experience to the world of the book. One of the books I have pictured on this slide, The Miraculous Journey of Edward Tulane, provides just such a story. In it, a toy bunny, Edward Tulane, begins life as a treasured but self-centered toy. Over the course of his truly miraculous journey, Edward experiences many different kinds of homes and love. But it is not until he is loved and needed, until his own gifts are drawn out, that Edward experiences the right kind of love, a love that allows him to become meaningful to himself precisely because he has become necessary to another. On a practical level, task appropriateness in the English Language Arts classroom translates into text appropriateness. The work of a language teacher is literacy, and we teach literacy using texts. If the text is too difficult, students cannot learn to read, interpret, analyze, conceptualize, or infer from it. Therefore, we need alternate, modified, and “choice” texts. Sometimes those can be texts rewritten and partially summarized for lower reading levels, such as the Early Classics series. Sometimes they can be children’s versions of a classic text, such as Gillian Cross’ version of The Odyssey. And sometimes they can be a collection of “student choice” texts centered around a common theme, allowing greater student investment in what they read as well as better matching of student reading level to text. Another of the texts pictured on this slide, The Bluest Eye, provides an example of a text that is available to a wide variety of reading levels and rich enough to provide meaningful comprehension, interpretation, and inference tasks. But The Bluest Eye serves the student in another important way as well. It is a narrative about cognitive development, and the attainment of self-acceptance through the ability to view oneself in different cultural contexts over the course of time. Stories allow students to develop Theory of Mind. In many ways, we can think about The Bluest Eye as a story that develops egocentric Theory of Mind: a vision of self seen through the construct of otherness. But true Theory of Mind requires empathy, i.e., understanding how other people feel and why they feel that way. Theory of Mind includes an ability to understand multiple points of view synchronously. It is related to Piaget’s and Kohlberg’s stages of cognitive and moral development, since it describes a progression from egocentric thinking towards thinking that takes into account how other people see the world. Unlike Piaget’s and Kohlberg’s theories of development, however, Theory of Mind postulates that children grow by becoming able to mentally grasp more than one “truth” at a time. In other words, Theory of Mind requires individuals to hold onto cognitive conflict without resolving it. So what does Theory of Mind have to do with stories? Stories require us to fully cross the divide between self and other while maintaining separate and individual selves. We retain our identity as reader, while experiencing the story through the “I” of the character about whom we are reading, from whose point of view the story is told. And we experience not only the story, but the emotions and thinking of that character. 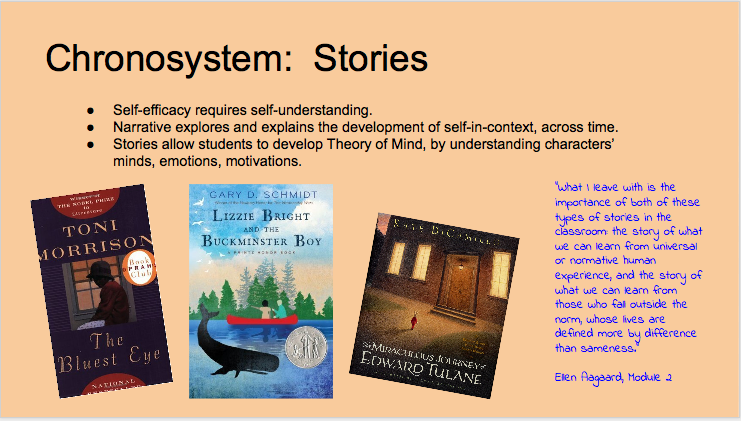 The text pictured in the center of this slide, Lizzie Bright and the Buckminster Boy provides a text that echoes the reader’s Theory of Mind experience. Over the course of the story, a preacher’s son (the Buckminster Boy) connects with a new friend, Lizzie Bright. Their histories and circumstances are radically disparate in terms of race, education, power, wealth, and gender. Yet their friendship, like an empathetic reader, crosses this chasm of difference on the bridge of shared story. If I were to choose one way in which I would like to improve my use of stories in the classroom, it would be just this: to increase my collection of stories. Stories that allow students to connect with characters who are both like and unlike themselves. Stories that address variance in language proficiency as well as the human variety that fills our classroom. Stories that help students understand both themselves and others. This entry was posted in 3.1 and tagged cognitive development, language proficiency, self-efficacy, story, Theory of Mind on August 16, 2015 by aagaarde.